Cupcake Bingo | Claim £30 Free + Free Spin, New Site! Cupcake Bingo has launched this month and is one of the sweetest and tastiest new bingo sites around. Powered by the Dragonfish network, this new site is the hottest place to be and offers a mouthwatering blend of sweet bingo fun with a side of home-baking. With a delicious cupcake-themed background, the visuals are filled with sugary cupcake delights and home-baked frosted-fun to wet players’ appetites! Players can expect similar promos to other Dragonfish sites such as Sugar Bingo. As soon as a player signs up to the Cupcake Bingo site, they will be treated to a tasty welcome bonus. With a first deposit of only £10, players will get £30 FREE, plus a delicious cupcake delivered to their door! This sweet welcome offer means players can kick-start their adventure with a 300% bonus, which is up to £100 in free Cupcake funds. High-rollers can expect even more perks. Players can also enjoy a FREE SPIN on the Cupcake Wheel, to grab another appetizing £2,500 extra free. If that's not enough, they can also play to win up to £45,000 in FREE bingo each month, and grab tempting cashback prizes, sweet freebies and more! 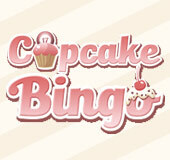 Cupcake Bingo boasts a red-hot selection of fab online bingo games! On the menu is a tasty blend of 75-ball, 90-ball games and even Live Bingo 24/7, and they can check out a variety of bingo rooms from backstage bingo to the sauna. There are daily jackpots like Kiss n’ Tell Thursday, guaranteed jackpots worth up to £10k and tempting progressive jackpot games like Super Millionaire with up to £1 million up for grabs. Players really are spoilt for choice as they can also tuck into classic slots like Fluffy Favourites, hit the Blackjack or Roulette tables or try their luck playing sweet Scratch Card instant win games. They can also spice up the party by joining the Cupcake community chat rooms, and continue their sugar-rushing adventure on the go by playing Cupcake Mobile!